I was angry when I did this to Adobe's San Fran office last night. In 2007 Steve Jobs first responded to the lack of Flash on the iPhone by stating that the current version of Flash is too resource intensive and that the current version of Flash Light was too limited. We all nodded our heads and bought what he was selling (both literally and figuratively). Back in those days Steve’s statements encouraged Adobe to devote resources to improving Flash player for mobile devices. About 2 years ago, CEO Shantanu Narayen even went so far as to announced at the World Economic Forum that Adobe was working on a version of flash for the iPhone and later noted that putting Flash on the iPhone would be trivial and that it was completely up to Apple. While this is complete speculation, I’m guessing that there is working copy of Flash on the iPhone and it’s been sitting in the basement of the Adobe headquarters for the past two or three years. Actually, it’d be silly if Adobe didn’t have a version of Flash locked away on an iPhone somewhere. We are talking about intelligent Adobe engineers here. And getting root access to the device has been trivial since late 2007. If the mobile version of safari is void of the normal plug-in hooks then Adobe could have just dropped a completely different browser on the operating system. I don’t pretend to know how Adobe could engineered it, I’m only theorizing that it’s highly likely to have already been done. Now it’s 2010 and we all know that Steve never intended to allow Flash on the iPhone. Furthermore Steve’s been running his mouth all over town, calling Adobe “lazy”, encouraging media companies to drop Flash and even calling Flash a “CPU hog,”, source of “security holes” and calling Flash a “dying technology”. It looks like Apple is continuing to impose restrictions on their devices that limit both content publishers and consumers. Unlike many other ebook readers using the ePub file format, consumers will not be able to access ePub content with Apple’s DRM technology on devices made by other manufacturers. And without Flash support, iPad users will not be able to access the full range of web content, including over 70% of games and 75% of video on the web. It appears to me that Apple is throwing punches and Adobe is quietly trying to play by the rules, hoping that mounting peer pressure will influence Apple to consider adding Flash to their handset. Well it obviously this tactic isn’t working. Flash on the iPhone would be a significant financial hazard to the iTunes empire. Music, movie and application content are too valuable a resource to Apple. Allowing Flash content on Apple’s mobile deceives would threaten that money making machine. Adobe need to try a new approach. If I were Adobe and I wanted to play hardball with Apple, I’d let the basement version of Flash for the (jail broken) iPhone slip out the backdoor. Claim it wasn’t you, claim someone stole it, or even sue; but Adobe should ‘accidentally’ let this software slip out the backdoor and allow it to enter the wild world of the interwebs. Lots of folks would avoid it but watching Hulu or other Flash content would be too tempting for many of the general public. Plus, I’d be eager to use some of that multitouch Flash Player 10.1 goodness on this device. In a matter of days we would start to see a significant increase in the amount of hacked iPhones. This is the kind of pressure that Apple would have to respond to. 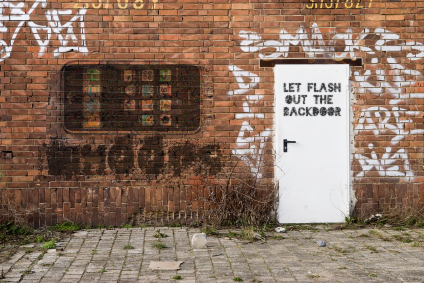 I have no doubt that Apple would much rather see Flash on the iPhone than a growing percentage of hacked iPhones. Sure, Apple would first try to fight it. They’d probably say jail broken phones are illegal, but we aren’t renting these phones and the general public can do whatever we want with our property. At the end of the day Apple would just be plum out of luck and there is nothing they could do about it. Lots of folks would avoid the hassle but watching Hulu or some other flash content would be too tempting for many of the general public. There would be mounting pressure on Apple to just give in and allow the plugin. And maybe, just maybe, Apple would listen. Does anyone else think this is possible? This entry was posted on Wednesday, March 31st, 2010 at 4:46 am and is filed under Blog. You can follow any responses to this entry through the RSS 2.0 feed. You can leave a response, or trackback from your own site. Possible, but not likely. Adobe needs Apple. The Flash player doesn’t make them money so much as selling software makes them money. And LOTS of their customers use Macs. Jeopardizing the relationship with Apple is dangerous, not only because of what Apple might do to them, but they risk offending all their Mac users. If asked to choose sides between Apple and Adobe, many may choose Apple. I doubt if the iJailBroken community is going to be big enough to be a commercial threat to Apple. But, it would be a PR threat. If there were a good number of people out there with iPhones/iPads running Flash and showing just how responsive it actually is then Apple would get a black eye. That excuse that the Flash just isn’t performant enough would wash away and would fore them to come up with another excuse. Everyone I’ve shown my jailbroken iphone, has jailbroken their phone with the PwnageTool. When average non-tech-geek users see what their missing out on with conventional iphoneOS products, they feel distaste for Apple’s stance. Thanks. But the rest of the world matters more than just one brand. If Apple does come along, that’s great. But even if they stay walled-off, Adobe tooling will work to connect creators and their audiences on that brand of device as well. The real story these days is this entire class of new and powerful yet economical devices arriving in the world. The Apple stories have prominence in English-language blogs, but are really only one sub-thread in the whole. 3. Player’s speed? Well, see #1! 4. Memory management: developers need to be able to evoke the GC, etc. And then there’s the whole Flash CS5 approach to iPhone dev! Why not compile AS3 into iPhone binary as opposed to the packager approach? When under Macromedia, Flash used to be a very compelling platform. Now, with Adobe trying to do the whole software-by-committee thing (esp. hitching AS3 to a now-defunct standard), we have JS/Ajax script-kiddies and Silverlight devs able to do some of the things that only Flash could do. Interesting suggestion… but I am a Flex developer and iPhone owner and I am much more likely to buy a different phone or different brand of tablet then bother jail breaking my phone. There was a time when Apple’s devices were so much better than everything else that there was no competition. And as a result consumers lived with the limitations or the device. However, now there is plenty of competition coming which I am eager to switch to. When my phone contract is up in the fall I am most likely going to check out the new Windows phone or whatever Google magic phone exists at that time. I think things are going to be a bit different once Flash Player 10.1 is released and widely distributed on other mobile phones. Apple has hid behind supposed technical reasons (too slow, buggy, battery draining) which based on demos of Flash on other mobile devices, falls flat. However, only developers have seen these demos, once the general public sees that Apple is blocking them from seeing and using certain sites that are available in other devices just fine, there’s going to be a lot more pressure. Especially since if the HP Slate is any indication, other companies will be advertising the fact they include Flash and will able to view the full web, while Apple devices disable this. I’m not sure if Apple will change their stance,but showing the general public what they are missing with Flash Player 10.1 on other devices will be a lot bigger effect than allowing jail broken devices to include Flash (which could cause Adobe to get into all sorts of legal hot water). I don’t agree with apple’s position. With android products able to access flash websites this will encourage users to buy android tablets and phones contrary to the interests of apple. Apple must work with adobe to remove deficiencies you mention to avoid new users choosing android and stop apple users changing to android.